My son has been calling it Sprinter: the spring that thinks it’s winter. Around here, it’s been snowstorms or rain almost every weekend and sometimes in between, all of it with what seems like a three mile thick layer of gray clouds overhead. I actually started writing down and timing when the sun came out each day, and the average duration was about 10 minutes of blue skies before it vanished again. We have two cherry trees in our backyard. 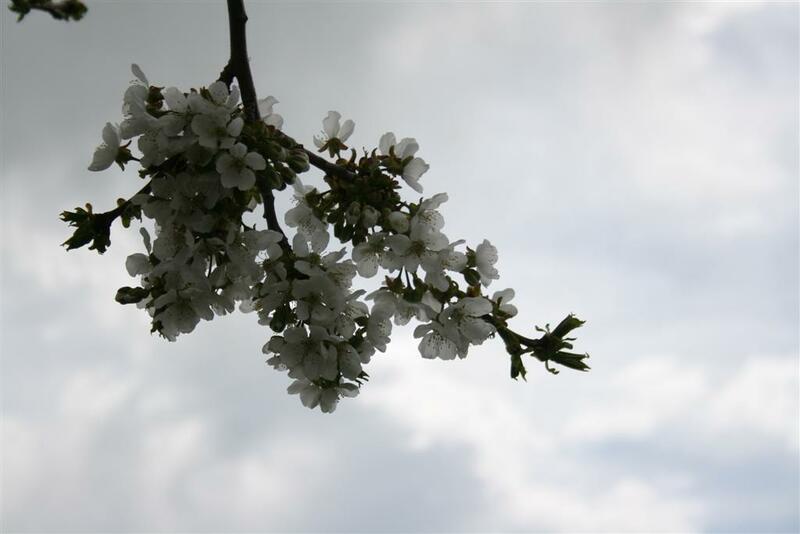 One has been covered with blossoms and the other seemed barren. (My son has been cheerfully tapping the snow off them after every storm in an attempt to be sure we can save all the branches.) We take for granted the apparent health of one and worry about the other. 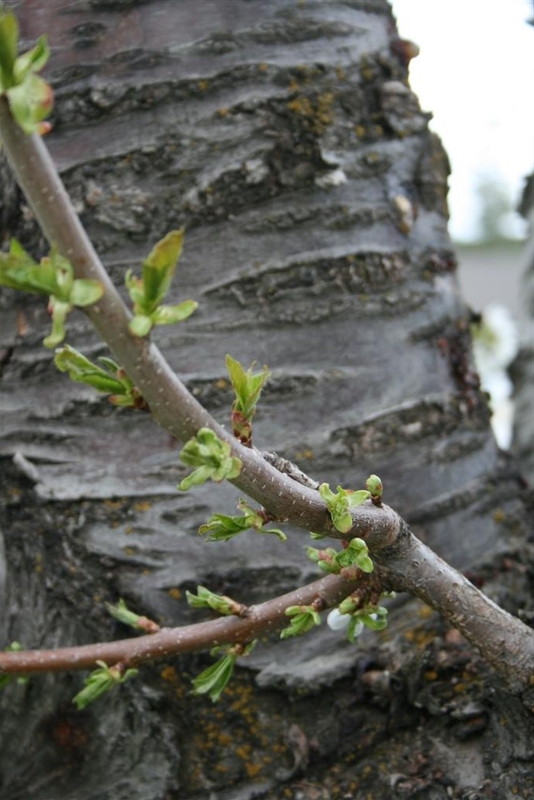 Imagine my delight when I found the first sign of new growth on the seemingly struggling cherry tree. When the first hints of green were followed by lovely white blossoms, I had to capture the magic of it all. 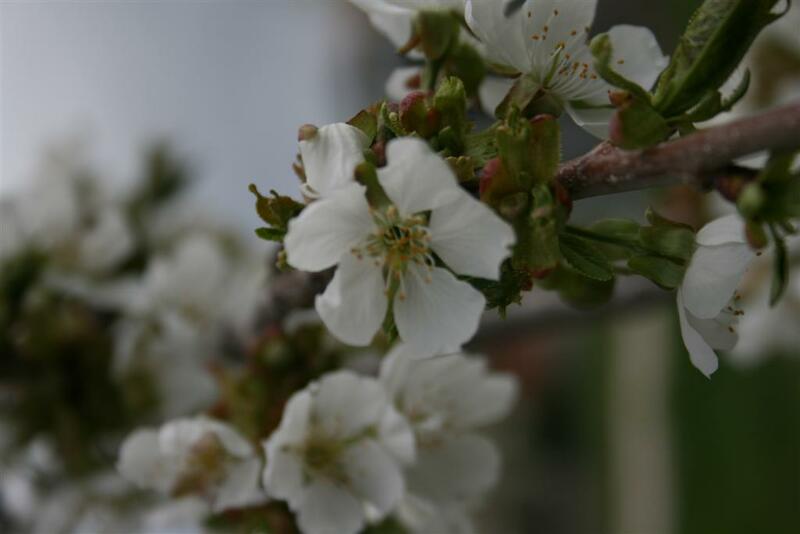 My tree reminded me of one of life’s lessons: everyone blooms in their own way and at their own time. We have two trees, growing side by side in the same yard, and yet they each blossom on their own schedule. People are like that. Children are like that. I guess the magic comes when we learn to notice and appreciate the signs of growth in ourselves and others. 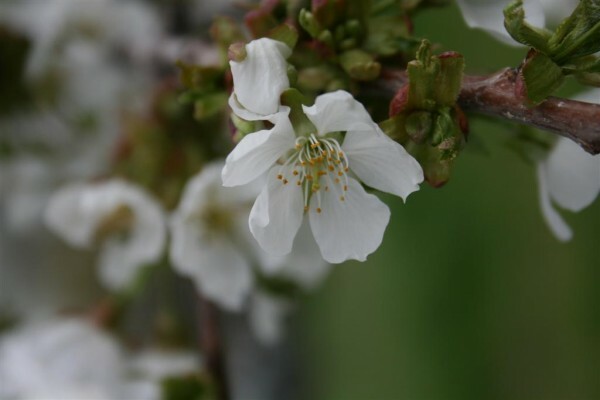 And be prepared to celebrate the blossoms whenever they come, having hope and faith that they will appear. 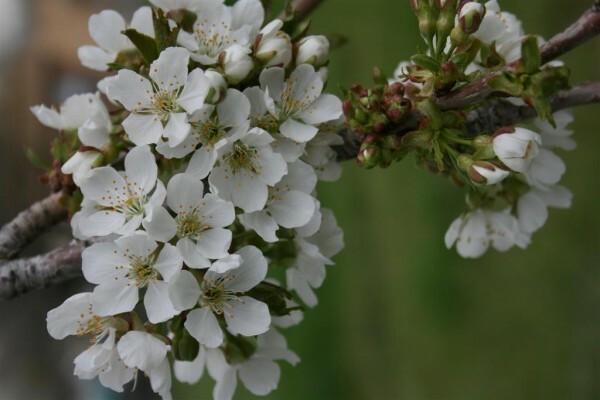 Where I live, it will go from cold to hot in a couple of weeks, with only a fleeting taste of perfect spring temperatures. I guess I’ve got to just enjoy it while we’ve got it. 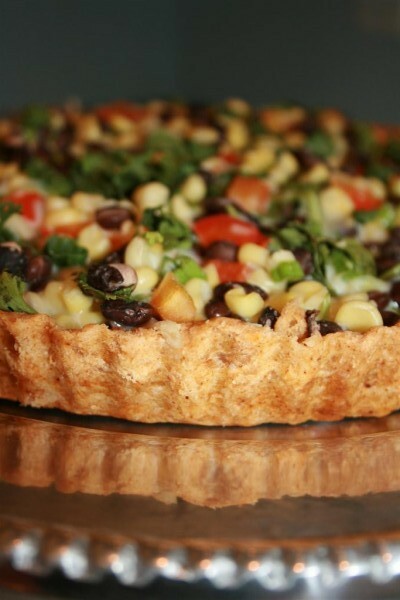 This black bean tart has been a favorite in our home for many years, often requested for birthday dinners and special occasions. It’s meatless and flavor-packed, full of vegetables, and beautiful. My kids eat so much of it that I now have to make four of them for our large family. It’s not difficult, but does take some planning ahead to get the crusts made. It also tastes great as a leftover. Recently I served it for lunch at a quilt retreat with some of my favorite quilters and not only did they love every bite, but they also requested the recipe. You’re going to love it! Start with 1 1/2 cups flour. Add 1 teaspoon ground cumin, 1 teaspoon chili powder, 1 teaspoon paprika, and 1/2 teaspoon salt. Mix them all together, and make sure you enjoy the wonderful smell of all those spices together! Next, add 6 tablespoons cold butter. Cut the butter in with a pastry cutter. The mixture should resemble coarse crumbs. Add 6 tablespoons of cold water to the bowl, adding a little more water if needed, until you can form a ball with the mixture. With a rolling pin, roll dough out into a circle until you have covered the pan bottom. 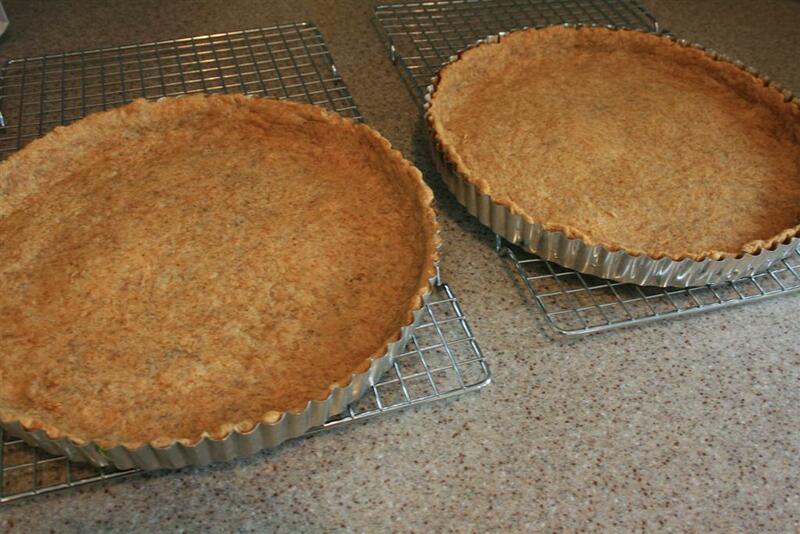 Carefully pick up the pan bottom and place it inside the tart pan. Using your fingers, press the dough up the edges of the pan. Chill the crust for 15 minutes. Preheat your oven to 350. Line the unpricked crust with foil and bake for 10 minutes. Remove the foil and bake another 8-10 minutes or until the crust is beginning to turn a golden brown. Remove crust from the oven and allow to cool completely! 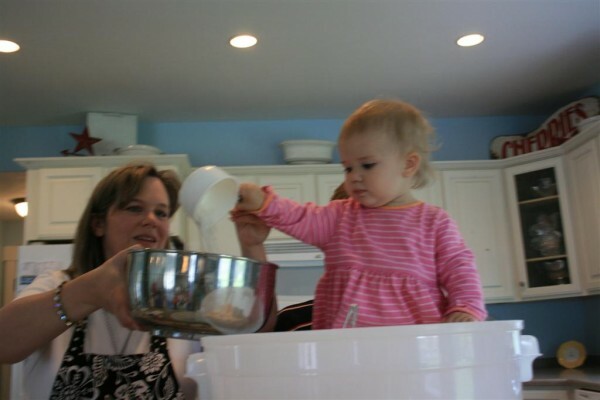 And since cooking at my house is usually done with more than one child hanging on my legs and sometimes with more than one helper, I thought I’d share this shot my daughter took of my 16 month old baby helping measure the flour for the second crust. Rinse and drain 2 (15 oz) cans black beans. 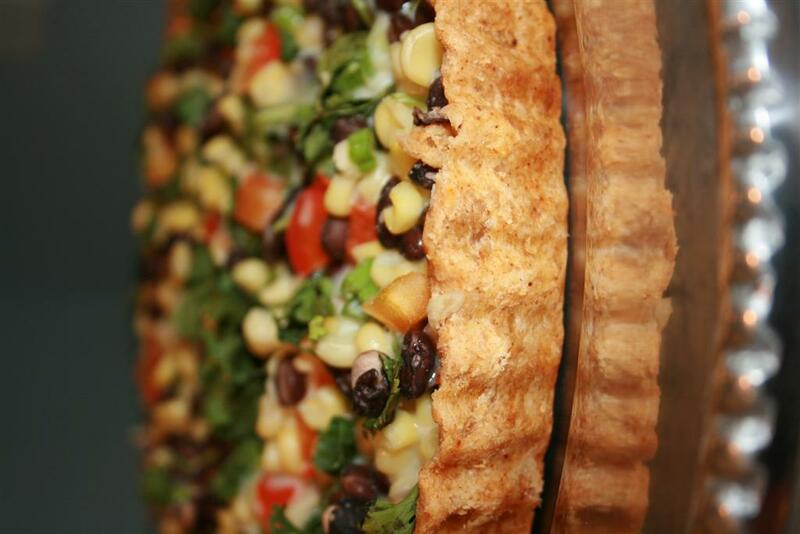 Thaw 12-16 oz frozen corn, and drain if necessary to avoid a runny tart. We prefer sweet white corn. Chop one sweet red pepper. Slice 1/2 cup green onions. Now chop 1/4 to 1/2 cup fresh cilantro (I love the smell of chopped cilantro!) If you don’t like cilantro, you can substitute parsley. My family likes cilantro so much that I usually add a little more than 1/2 cup. 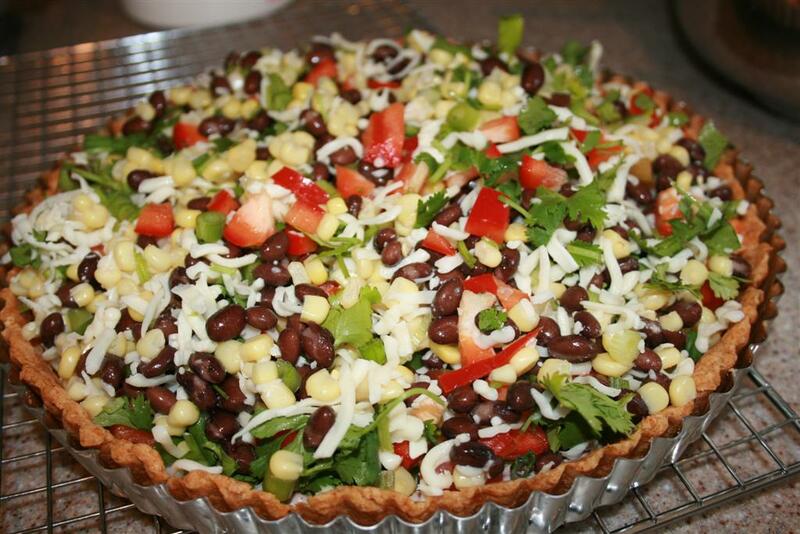 In a large bowl, combine remaining black beans, corn, red pepper, green onions and cilantro. Add 1 1/2 cups cheese. You can use mild cheddar, colby-jack, monterey jack, or whatever blend you like. Mound filling into crust. Filling should sit higher than the edges of the pan but will settle while baking. 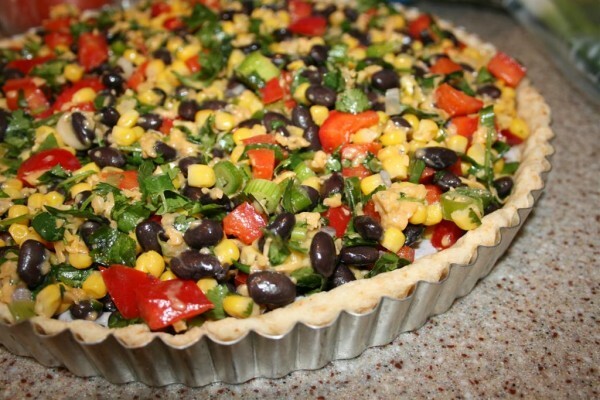 Place tart in 350 degree oven and bake for 20 – 25 minutes or until cheese is melted. Remove from oven, let cool just long enough to allow you to carefully remove the bottom of the pan and then serve! We like black bean tart best when served with creamy cilantro ranch dressing drizzled over the top (or in the case of my teenagers, drowning in dressing). In bowl, combine flour and spices. Cut in butter or shortening with pastry cutter until mixture resembles coarse crumbs. Add enough cold water to make mixture form a ball. Roll out or press dough onto bottom and up sides of a 9 to 11 inch fluted tart pan with a removable bottom. Chill for 15 minutes. Preheat oven to 350. Line unpricked tart crust with foil and bake for 10 minutes. Remove foil and bake 8-10 minutes longer or until golden brown. Cool on wire rack. Rinse and drain black beans. Thaw and drain any excess liquid from the corn. Chop red pepper, green onions and cilantro. 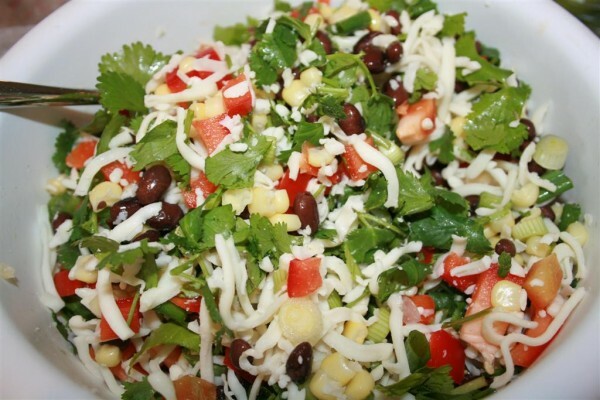 In large bowl, combine remaining beans, corn, red peppers, green onions, cilantro and cheese. Spoon mixture in to crust (the pan should be very full). Bake at 350 for 20-25 minutes or until cheese is melted. Remove from pan and serve! Chop cilantro and tomatillos. Place all ingredients in a blender or food processor and process until smooth. Chill before serving, if possible.